This free political map of Africa shows mainly boundaries and some political areas, major cities and other selected data, which are characteristic for Africa. Political map should help you to find your way through this part of the world and choose all the cultural and architectural attractions which will make your visit here interesting. 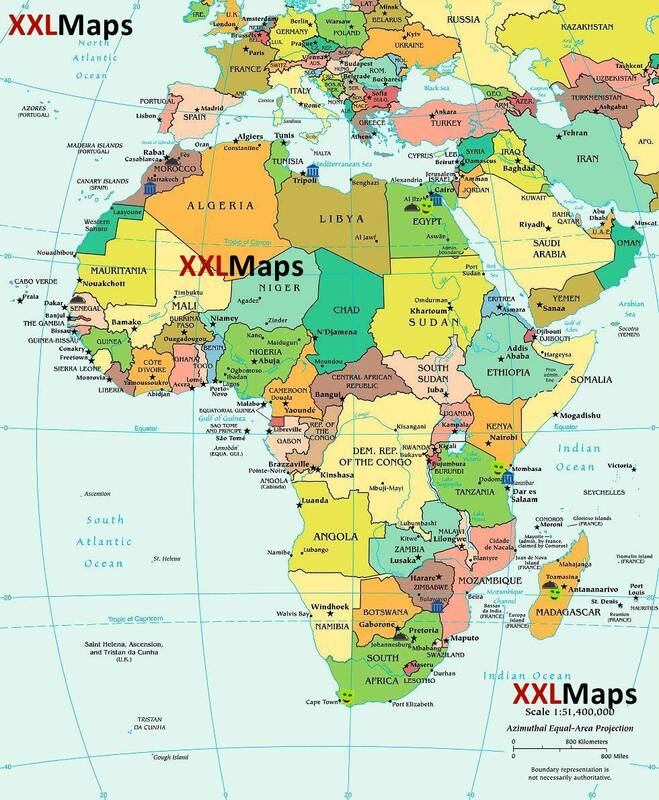 Let us add that Africa certainly offers many more interesting places and we will keep preparing more free maps that give you more detailed information about them - to help you plan your holiday. And what beautiful places Africa offers? Here are just a few examples: The pyramids at Giza in Egypt, Roman sights in Libya, picturesque streets of Zanzibar city, modern Johannesburg - all these places are on one continent, Africa. South and East Africa is probably the birthplace of modern Homo sapiens, but it is not only about so far history in Africa. Think of Marrakech in Morocco, a fine blend of the ancient and the modern, Luanda, the capital of Angola going through a intensive renaissance...These are, however, just selected cultural and architectural beauties of Africa. But if you decide to go there, you will find that there are many natural beauties that are worth seeing also. And experiencing them firsthand. Many of them can be found here on other maps.